Redglo is a scientifically formulated, highly palatable, premium quality, energy and iron-rich multi-vitamin supplement. It is homogenized and totally in solution to ensure rapid and maximum absorption by the horse. IT CONTAINS NO BEEF INGREDIENTS. 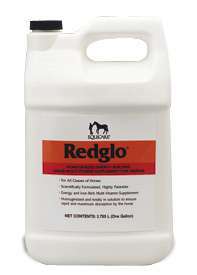 For horses in training, feed 2 ounces of Redglo once or twice daily. For horses not in training, feed 1 ounce daily. This product can be mixed into feed or fed orally by syringe.